Not everything I read is in my favorite genre, historical fiction. Last week, while checking out a patron at the library, I happened upon a wonderful book called No-Churn Ice Cream by Leslie Bilderback. I didn’t have the opportunity to glance at the recipes, but the no-churn aspect caught my eye. I don’t own an ice cream maker and have no plan to buy one in the near future. I’ve also heard that the salt required for the freezing process with a machine can be costly. So, I placed a hold on the next available copy and waited. I’m such a skeptic that while I waited, I convinced myself that homemade ice cream would still be costly and that there is no possible way to make it without an investment in some sort of machinery. I am so glad I was completely wrong. 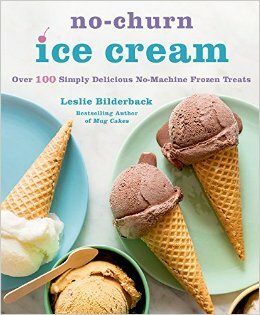 The ice cream recipes featured in Ms. Bilderback’s book are simple, elegant, and even without having made one yet, I’m sure they are delicious. They range from the basic vanilla and chocolate to the adventurous strawberry-rhubarb, pineapple-pepper, and lavender. The book also features sorbet and gelato in unique combinations. My favorite part of the book is the ingredient list. You won’t be scouring the Internet for bizarre items available at an outrageous price from countries you’ve never heard of. This fact only strengthened my need to own this particular book. If you love ice cream, and who doesn’t, No-Churn Ice Cream should be the next book you check out or purchase. the best thing for a hot summer day!